My aerial was just long enough to fit to the tv so to lengthen it.. I cut it right back to near where it enters the room through the wall / window area and fittted a plug to it. I have new aerial cable which I’ve cut to desired length and fitted a plug to either end of that. Then connecting both using a connector. But there’s now no signal!!! Any help would be appreciated. One assumes that the Aerial Cable is Coax and that you soldered the centre wires and the sheath? The inner core must extend down the plug and check that the inner core is not touched by the outer mesh at any point in your plgs and scokets. You don't need to solder the center wire, And even if the outside braid touches the center wire you would still get some sort of signal. To get no signal at all would seem to be impossible if the cable did connect to the TV Before and you had a signal. Take it you are using the normal Coax cable meant for a TV aerial. Don't follow you, ""Then connecting both using a connector. But there’s now no signal" I take it you used a female connector plug to the Cable at the window connected the new cable and then plugged the other end on to the TV. Go get a longer cable,not rocket science. 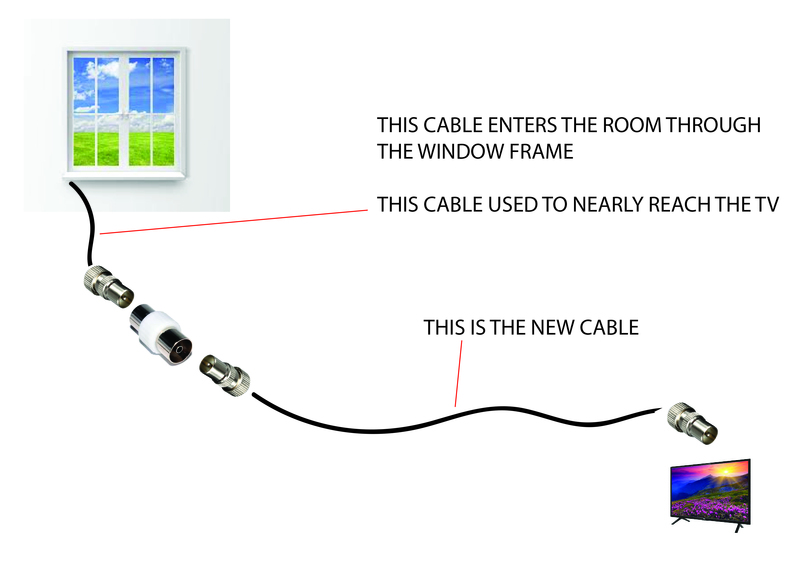 Not possible if the antenna cable was a single piece of co-ax connected to the antenna on the roof at one end and the TV at the other rather than terminated at an antenna socket in the room. Thanks for all the replies.. This is a diagram of the situation... :) I'm sure this is fine? maybe I've just wired it wrong! That's all you need. Nice diagram. If it nearly reached the TV does that mean you have not used it before. And also check that it is still connected on the roof aerial.